I dare you to reflect for a moment … can you remember the child that you once were? Before you became a ‘grown-up’ with inhibitions and a cluttered mind; you were once that ‘child’ that Paul Klee referred to as “The giant of authenticity”. It is no easy task to find, let alone embrace, the child deep inside the sophisticated adult. I wonder if there was any possibility today if you would be brave enough to ask that child to do a painting on behalf of your adult self. You have achieved success as an artist if you ‘ve been able to reach out to someone and make them experience or feel something. To do so an artist has to express a sense of vulnerability and transparency through his medium of choice, and he has to do so with conviction.A pretender will quickly be sniffed out. Authenticity defined the great artists throughout history. We need only to look at Vincent van Gogh’s paintings to understand that he is telling the truth. His paintings didn’t lie; they spoke to us clearly not only of heartbreak and loneliness but also of sentimentality. Perhaps it is the innocent beauty of the night sky in ‘Starry Night’ and the naivety and prettiness of his ‘Sunflowers’ that touches a deep chord inside us all. Vincent spoke to us through his ordinary and everyday images. We all have bits of ourselves that we don’t like and would rather hide from the world. It is all about Image today. Wealth, health, wit, charm, beauty and character, we all strive to show the world that all the pieces of our personal puzzle fit.Be yourself in your art, having said that I don’t believe anyone’s art is ever truly original, we are all influenced or inspired by someone along the way.New ideas are hatched from what know already. But perhaps the secret to discovering the artist inside is to drop the mask and dare to peek underneath. If only we could ‘unlearn’ what we have learned to know our real selves again. Self-discovery, acceptance and ultimately an appreciation of oneself are necessary to reach truthfully out to others. If you believe in your art others will too. 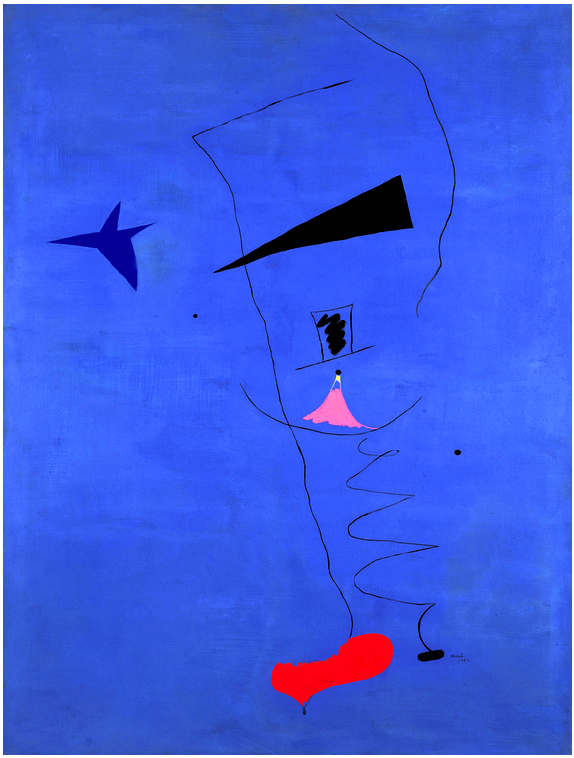 His painting “Peinture- Etoile Bleue” – Blue Star fetched 23.5 million pounds at auction by Sotheby’s in London in 2012. Learn from other artists, about their techniques and style. Be inspired by them, and then make your own. Abstraction may be an attempt to recapture a childlike sense of vulnerability. Picasso thought that it was far more challenging to paint in an abstract style than it was to be purely representational.